This past September, I spent the final night of a Mexico trip in Mexico City. I usually stay near the Centro Historico, but I was looking for a new place to stay. 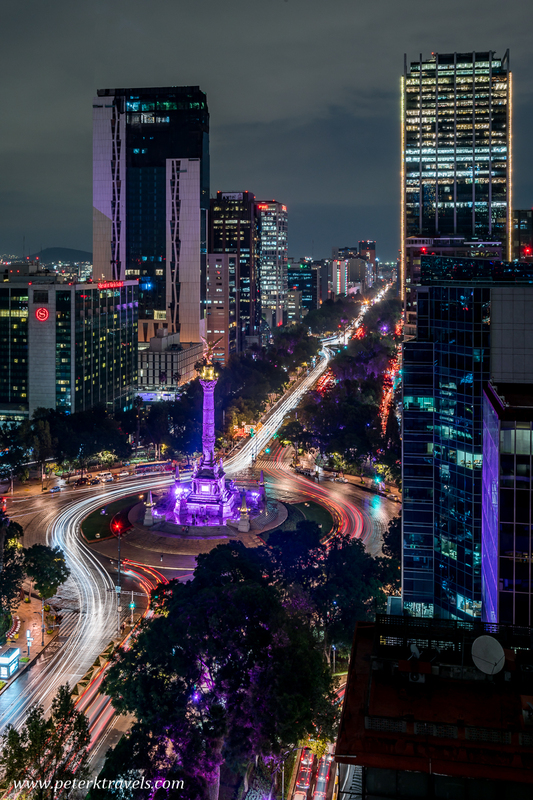 I found myself staying in a 27 story tower located on the Paseo de la Reforma, near the Ángel de la Independencia statue. I picked the location because of the availability of a rooftop terrace to take photos from. As it grew dark, it started to rain, as it often does in Mexico City that time of year. I waited it out a bit, and then got a few shots from the roof. There were low clouds which reflected back a lot of light, so I didn’t get a dark blue or black sky. I used a longer exposure to show the car lights moving through the traffic circles and around the statue. The Paseo de la Reforma and El Ángel de la Independencia, Mexico City. Although I like this view, the view from the Sheraton (middle left) would be better for the Ángel de la Independencia and the traffic circle. From this viewpoint, the trees in the foreground block the view of the traffic. However, I don’t think the Sheraton allows people on the roof, and it’s a much shorter building.